These were the words which Bishop Theodore G. Romzha, the Apostolic Administrator of the Mukachevo Eparchy (1944-1947), chose as his motto, i.e. the guiding principle of his episcopal ministry. He was only 33 years old and yet he had to face the invasion by the Soviets, followed by the persecution of the Greek Catholic Church in Subcarpathian Ruthenia. However, he did not lose heart. He defended his spiritual flock with great courage and love He even laid down his own life for his sheep. Therefore, he justly deserves our esteem. In him we gained a powerful protector in heaven. Bishop Theodore G. Romzha was born of humble parentage on April 14, 1911 in Velikij Bychkiv, in the heart of the colorful district of Maramorosh, Subcarpathian Ruthenia. He was a pious and gifted young boy, and his only ambition was to become a priest. He received his secondary education at the gymnasium (high school) in Chust. Due to his friendly disposition and scholastic achievements he became one of the most popular students. His popularity increased even more when he proved himself as an all-around athlete, excelling in soccer. At his graduation, he took everybody by surprise when he announced his intention of becoming a priest. He was sent to Rome for his priestly formation. He lived at the German-Hungarian College in Rome for the first two years and then, in 1932, he moved to the Russian Pontifical Seminary, known as the "Russicum," in order to prepare himself for missionary work in Soviet Russia. It was indeed a providential step, since in the "Russicum" he was expected to study communist atheism and its ideology. Thus. unwittingly he prepared himself for the Soviet occupation of his native land. He was ordained to the priesthood in Rome on Christmas Day, December 25, 1936. In the summer of the following year he came home to celebrate his "first" Liturgy with the intention of returning to finish his doctoral dissertation. But instead of returning to Rome, he was drafted into military service and sent to protect his country against the German invasion. To his friend in Rome he confided: "I am going to the front with a deep conviction of doing the will of God. Therefore, I do not fear what will happen to me." Those were turbulent days in Europe. Even after Father Romzha's discharge from the army in August, 1938, the danger of approaching war remained. For this reason Bishop Alexander Stojka (1932-1943) did not permit him to leave the country, but appointed him to a forgotten parish of Berezovo, Maramorosh District. The young priest Romzha became a poor pastor among poor people. There were times when he could afford only one meal a day while trying to help his needy parishioners. But he did not complain. On the contrary, he was always ready to help. To his curious friend in Rome he wrote: "I live here as a pauper and yet I feel happy and satisfied." Father Romzha was a good and dedicated priest. He taught his parishioners not only to know their Faith but also to live it. The parishioners once again became proud of their small church. They could never forget him. He was their best pastor ever. In March, 1939, the Hungarians once more occupied Subcarpathian Ruthenia by force. Great political and ecclesiastical changes followed. Bishop Stojka was forced by the Hungarian government to reorganize even the Seminary Staff. Thus, in the fall of 1939 Father Romzha was appointed Spiritual Director and Professor of Philosophy at the Eparchial Seminary in Uzhorod. One of his students later recalled: "He was strict and demanding as a Professor, but as a Spiritual Director he was fatherly and kind. He knew how to inspire us and to bring out the best in us. Staying in close contact with us, his students, he was able to transplant into our hearts the main features of his strong priestly character. His dedication, genuine piety and generosity of heart." Even at the Seminary Father Romzha found some time for pastoral work by helping in the neighboring parishes. He enjoyed conducting missions and retreats for young students. Every penny he earned he generously distributed to the poor. To the mentioned friend in Rome he wrote: "I am living very unpretentiously, and yet my pockets are always empty. But I am not discouraged, since I am working not for the money but to please God." Bishop Stojka greatly appreciated the dedicated work of Father Romzha, and in 1942 obtained for him the papal dignity of Monsignor. But even then he remained a humble and dedicated priest, inspiring and winning the admiration and respect of all those who met him. On May 31, 1943, during the critical time of the war, Bishop Alexander Stojka suddenly died. In view of the uncertainties of the time, the Holy See appointed Bishop Nicholas Dudash, OSBM of Hajdudorog, as the temporary administrator of the Mukachevo Eparchy, While the Soviet army was rapidly approaching the Carpathian Mountains, the Holy See promptly appointed Msgr. Theodore G. Romzha to succeed Bishop Dudash as the Apostolic Administrator of Mukachevo. His episcopal ordination took place in Uzhorod, September 24, 1944. A month later, the entire territory of the Mukachevo Eparchy was occupied by the Red Army. Bishop Romzha was informed that Subcarpathian Ruthenia will be again incorporated into post-war Czechoslovakia as an autonomous province. However, it soon became evident that the Soviets would not relinquish this politically strategic region. Consequently, on June 291 1945, Subcarpathian Ruthenia was officially incorporated into the Soviet Ukraine. Thus the young and inexperienced Bishop Romzha found himself and his flock under Soviet atheistic rule. At the beginning, Bishop Romzha tried not to antagonize the Soviet authorities, although some abusive and violent actions committed by the Soviet soldiers against the clergy were reported to him. But when the Soviet authorities started to expel the priests from their parishes at random and confiscate the church property, he was forced to protest against such abuses. The Soviets had a ready answer: "Since the attitude of the Vatican is hostile toward the Soviet Union, the Soviet government cannot tolerate within its borders the Greek Catholic Church, loyal to the Vatican. Therefore there is only one solution for you. You must recognize and submit to the jurisdiction of the Patriarch of Moscow." Bishop Romzha immediately replied: "I will rather die than betray my Church!" This signalled the open persecution of the Greek Catholic Church in Subcarpathia. In the fall of 1945 Patriarch Alexis of Moscow appointed Bishop Nestor Sydoruk of Umany to head the Orthodox Eparchy of Mukachevo. Nestor was hailed by the Soviet press as the only legally appointed bishop, and received full support from the Soviet authorities. Intimidation, violent removal and imprisonment of leading Greek Catholic priests and faithful followed. It became clear that Bishop Nestor was appointed to liquidate the Greek Catholic Eparchy of Mukachevo. Bishop Romzha decided to fight. As the Good Shepherd he was ready to lay down his own life for his sheep. Although the Soviet authorities confiscated his car, he travelled long distance by horse and buggy, just to reassure his faithful and to encourage them to persevere until death, saying, "They are taking from us our own priests and churches, but they will never be able to take away our faith from us. During his extensive visitations Bishop Romzha tried to sustain the faith of the weak, to reassure the wavering, and to plead with those intimidated: "Faith is our greatest treasure on this earth. To preserve our faith we must even be ready to lay down our life. If we must die, then let us die as true martyrs, defending our faith. One thing is sure that we never will abandon our faith nor betray our Church." The faithful, supported by dedicated clergy, responded enthusiastically. They stood united behind their fearless Shepherd. Even some Orthodox parishes, seeing the violence and injustice perpetrated by the Soviets, asked Bishop Romzha to accept them back into the Catholic fold. During these days of violence and open persecution Bishop Romzha offered his prayers and sufferings for the perseverance of his clergy and the faithful. He was sustained by his unshakable confidence in God's Providence, and down deep in his courageous heart he vividly felt the protection of the Blessed Mother. There was no power that could shake up his loyalty to the Holy See. In his mind there was only "one, holy, Catholic and apostolic Church," established by our Lord on the rock of Peter and headed by His Vicar on the earth, the Pope of Rome. For this truth Bishop Romzha was ready to sacrifice his own life. The Soviets were unable to intimidate Bishop Romzha. Therefore, they decided to liquidate him. First they staged a highway accident. The horse drawn carriage in which Bishop was returning home from the rededication of the church in Lavki, near Mukachevo, was rammed by a military truck. 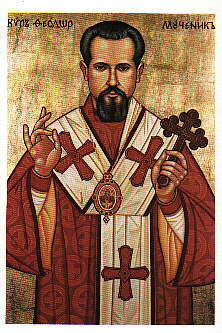 Bishop Romzha was badly injured, but he survived the attempted murder. The passersby took him to the hospital in Mukachevo. In a few days he began to regain his strength. Then suddenly, early on the morning of November 1, 19471 he was found dead. The night before Bishop Romzha's death, the director of the hospital and a strange nurse, who promptly disappeared the next day, were seen entering Bishop's room about midnight. They poisoned him! The Soviet authorities announced that Bishop Romzha died from injuries suffered in his highway accident, but the people knew better. They knew that their intrepid Shepherd was mercilessly killed for refusing to join the Orthodox Church. By his dedicated life Bishop Romzha highly glorified God on earth, and by his heroic death he gave living testimony to his Catholic faith, achieving the crown of martyrs. In him we, and our own Byzantine Rite, gained a powerful Protector in heaven. Let us then resolve to pray for his speedy beatification! O gracious Lord, in Your infinite goodness You have given us a fearless Bishop, Theodore G. Romzha, who by his uncommon courage, sufferings and violent death gave a heroic witness to his unshakable Faith and inspired our people to hold fast to their Faith in time of persecution. Therefore, we humbly beseech You to glorify Your faithful servant, that Man of Faith, Bishop Theodore, and to strengthen our Faith by granting us through his kind intercession...[here make your request]. For you are a merciful and gracious God, and we render glory to you, Father, Son and Holy Spirit, now and forever, Amen.